Argyll and Bute has been an attractive place to live from the earliest times. With its sheltered bays it was always easy to come ashore, settlement hugging the mainland coasts and islands and feeding inland along the rivers. The rich land encouraged farming which remained a mainstay as communities expanded inland over many generations. The abundance of other natural resources and good sea connections saw Argyll develop a high level of rural and even heavy industry from the 18th century onwards. Some were traditional industries such as boat building, but landowners and the government encouraged and often funded new schemes. The economy diversified into kelp, weaving, whisky, tile-making, mining, quarrying and many other enterprises, the products shipping out from the numerous piers which still punctuate the coast. Some of these industries have survived. Until fairly recently, Argyll was a division of the Highlands. Yet it has looked – and still looks – much more to the centre of Scotland and busy trade routes. While Bute faces the Clyde, Islay is within easy sight of Ireland. Both relationships have been critical for these islands and throughout Argyll at different times. 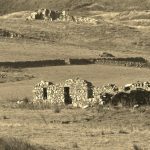 The communities of Bute, and Kildalton and Oa in Islay, have been working on a project which explores their history through landscape; re-imagining lives and considering the changes that bring us up to the present day. Balnakailly is a deserted settlement in the community owned woodland at the north of the Island of Bute, first appearing in records in the 16th century. The township has varied in its conformation, but what can now be seen are five buildings of varying ages and three enclosures for crops or stock. It was deserted in 1865 after a period of decline, but the remains of grey ‘Fergie’ tractor show it still had a role into the 20th century. It is a rare survival of a highland township on the island, and its long lifespan has caught the interest of local people; from the children who have been re-imagining the family life of the farm, to the Buteshire Natural History Society who have carried out detailed surveys. The farming township of Torradale lies around a mile inland, overlooking Lagavulin. Its early occupation is unknown but records from 1821 show ‘Duncan MacNab, weaver’ from Torradale as one of the first people to move to the new village of Port Ellen. The abandoned farm machinery is good quality and the land is well drained, which all tells of a robust working farm. One of the last to be abandoned in this area, it was still occupied in 1916. In the end it may have fallen victim to the First World War, rural communities suffering loss of workers while coping with tensions over land rights, leading to a wave of emigration in the 20th century, particularly to America. “Westering Home”, a song recorded 1955, about Islay. 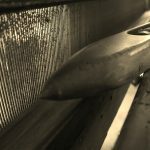 Weaving and local production, including reference to ‘Tora’ on the way to Port Ellen. Eleanor MacNab talks about Torradale. Main film achievement – Bute Balnakailly.